We’re not too far out from the release of BlazBlue Cross Tag Battle, and as we get closer, more information is bound to be released. Today, Arc System Works America revealed the Collector’s Edition for the upcoming fighting game, and it looks ever bit as packed with goodies for the fans as they would likely hope. Also released today was a brand new dubbed trailer for the game, showing off more of the Persona and RWBY crossover that’s featured in the title. As far as the Collector’s Edition goes, there’s a lot in it for fans to get excited about. To start, the game will come housed in a special high-quality box and include a steel book case. Also found within are an original soundtrack CD, a soft cover 52-page art book, and a set of acrylic stands featuring BlazBlue’s Ragna the Bloodedge, Persona 4 Arena’s You Narukami, Under Night In-Birth’s Hyde, and RWBY’s Ruby. Pricing has yet to be revealed for the Collector’s Edition, but players can preorder it starting on May 4. Both the Collector’s Edition and Standard Edition of the game will also include a 7-track mini-OST with preorders, so you’ll be getting bonuses no matter what version of the game you pick up. While we wait for preorders to go up, make sure to let us know if you’ll be picking up the Collector’s Edition in the comments below. 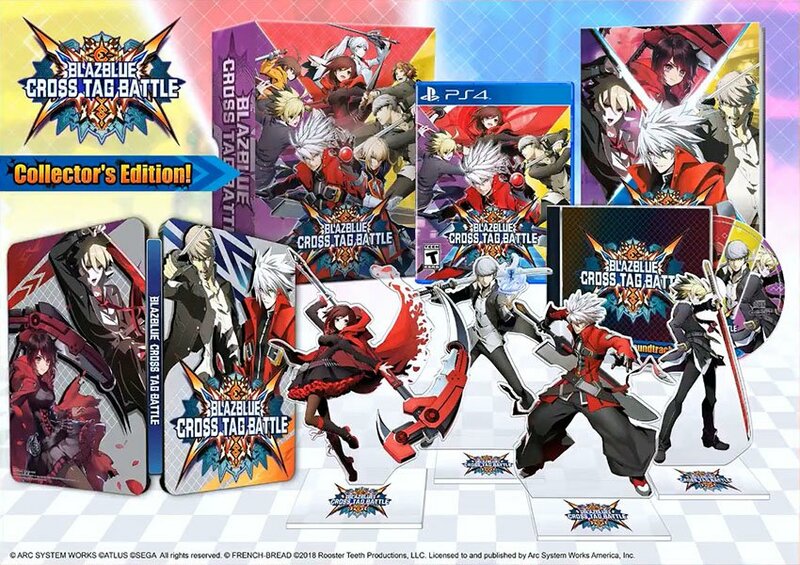 BlazBlue Cross Tag Battle will be released for PlayStation 4, Nintendo Switch, and Steam in Japan and Asia on May 31, and in North America on June 5.